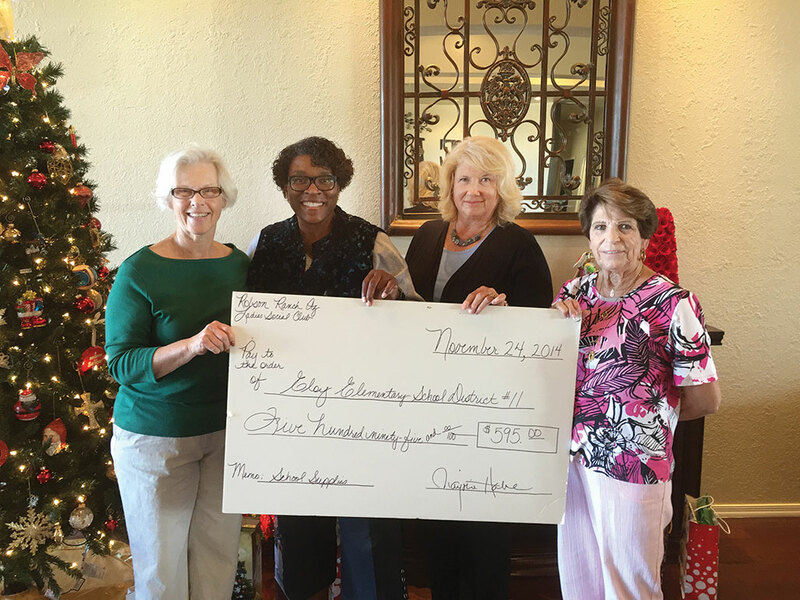 Members of the RR Ladies Social Club presented a check to the Eloy School District Superintendent. The RR Ladies Social Club supports a number of local charities and organizations. On November 24 they presented a check to Ruby James, the Eloy school district superintendent, for elementary school supplies. The check for $595 was presented to Ruby James by Meg Haber, Barb Crawford and Geri Nagy. This RRALSC was organized in 2007 by a group of women who shared a common goal: to gather together to socialize, to learn about their new home in the Sonoran Desert and to reach out to the local community through charitable giving. All women who live at Robson Ranch Arizona can becoming a member of the Robson Ranch Ladies Social Club. Many thanks to the members of the RR Ladies Social Club who donated to the school supply drive.